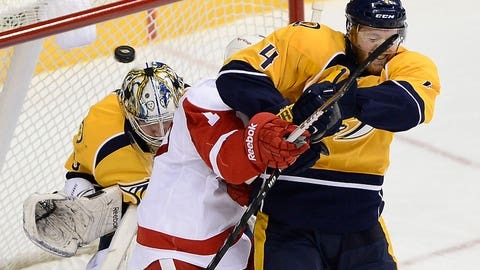 NASHVILLE, Tenn. (AP) — The Nashville Predators withstood every comeback try the Detroit Red Wings threw at them and skated off with a win. As two of the Original Six teams, the Red Wings and Maple Leafs have a storied rivalry, just not a rabid one -- yet. "There was emotion. There were lots of goals, sways in momentum, all the things that you have in sports," Nashville coach Barry Trotz said. "From that standpoint, I thought it was real good." "We found a way to shut it down and get that next one when we needed it," Fisher said. "That’s the sign of a good team, playing against a good team like that, we can win one in the third there." "It wasn’t very pretty, and it was a battle all night," Howard said. "To be honest with you, I felt like I was behind the play a lot and just didn’t get comfortable in their end. When I thought I was on the angles, I was off the angles." Spaling made it 3-1 at 4:24 of the second, but Datsyuk got the Red Wings back within a goal just 35 seconds into the third period with a one-timed shot from the right circle. "It was a good play by (Jones), and I just had to get it up over," Wilson said. "We are definitely more confident out there, and did well defensively." "There were times when we were doing a lot of good things and we’re sticking to the game plan, but for some reason we’re losing guys up ice and we’re not executing in our own zone," Kronwall said. "I thought we made it a little too easy for them at times. They got their chances a little bit too easily." NOTES: Nashville is 15-1-2 when it has scored first this season. … Wilson has points in three consecutive games. … Datsyuk has 69 points in 63 career games against Nashville.